Fife Window Cleaning Services offer commercial window cleaning in Dunfermline and Fife. We already provide office and retail window cleaning services to many commercial outlets within Fife, and have the equipment to clean windows several stories high; using an advanced reach and wash heated water system. Contact Fife Window Cleaning Services on 07856 539 498 or email us on our online contact form HERE. Fife Window Cleaning Services carry out commercial window cleaning with safety in mind; we have public liability insurance in place and also have a reach and wash system that allows us to carry out window cleaning from the ground. Additionally, we have the skills to traditionally clean windows; this is often useful for commercial units that are requiring inside window cleaning work. 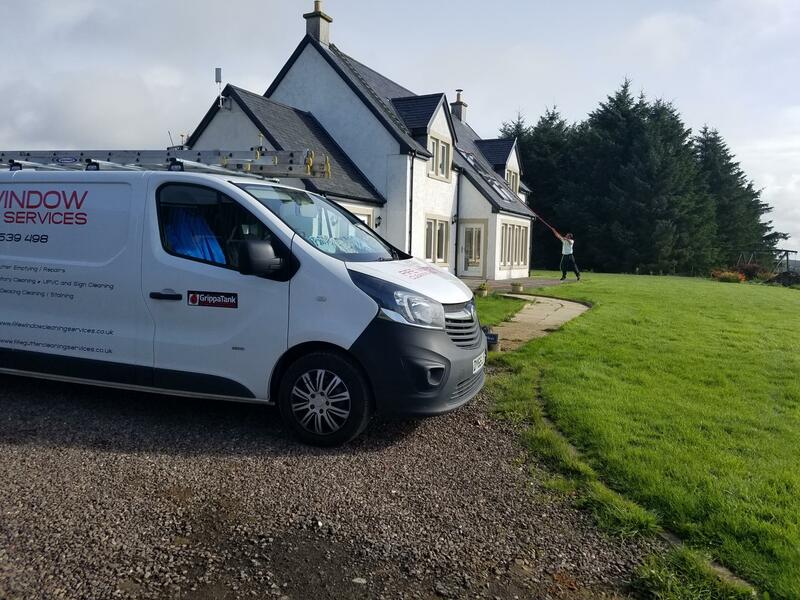 We don’t only clean windows, but also offer a multitude of other services such as gutter cleaning in Fife; and also pressure washing, and Upvc sign cleaning. See our home page for a list of such services. Fife Window Cleaning Services carry out all office and commercial window cleaning with a highly visible sign written van; and staff who are easily identifiable, through their company embroidered work wear. We can offer a regular cleaning service to your business, and offer very simple payment terms. Fife Window Cleaning Services clean commercial windows with a system that is specifically set up for hard to access window cleaning. We have invested in a van mounted system that not only produces purified water, but which also heats the water before it reaches the glass. The benefit of this is that we can use telescopic poles with specifically designed soft brush heads. With this system we scrub the windows and frames, agitate dirt on the windows and finally rinse the glass clean. The heated water helps this process tremendously, because hot water simply cleans better than cold water. Our system enables us to clean at heights a ladder would not reach, and also over canopies/entrances with ease.